Let the drinking continue!! It has been a very busy week, but don't think I've forgotten about my readers and your longing anticipation for cocktail month to continue!! I don't have much to say about this drink besides the fact that I got the idea from a restaurant and decided to make a much cheaper version. The drink I had at dinner included Domaine de Canton, which would be too pricy to purchase for one cocktail and not widely enough used to add to our liquor cabinet. I played around with different ingredients and amounts to create a cocktail more wallet-friendly for the Kettlers (and all of our amazing followers)! If you don't like ginger ale or want a less sweet drink, try sparkling water instead. Also, you can strain out the muddled grapes and basil leaves if you don't like sipping on leaves and pulp in your drink. If you are looking for a little adventure, try this drink to mix up your normal happy hour!! 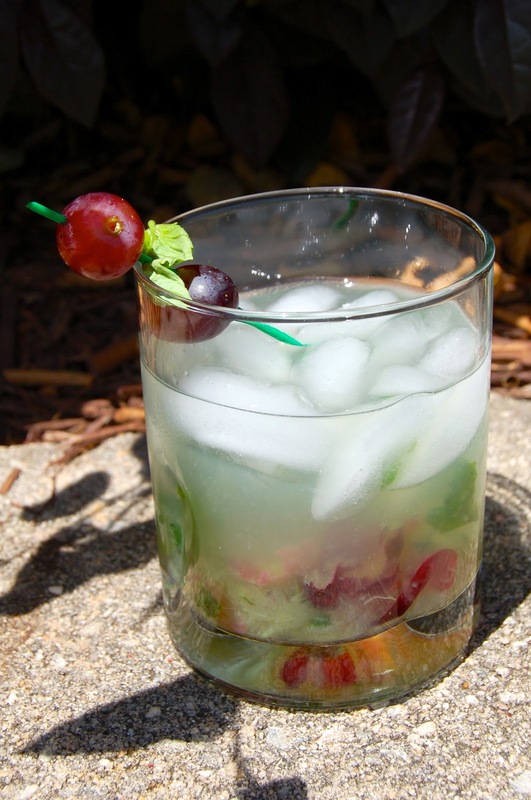 Muddle the basil, grapes and a small splash of ginger ale in a glass. Add in the vodka and squeezed lime wedge. Pour this into a shaker and give it a good mix. In a small cocktail glass, fill halfway with ice and pour in the mixture from the shaker (your choice to leave in the muddled basil and grapes or strain out). Pour the 2 shots of ginger ale into the glass and stir with a spoon. Sit back, put your feet up and enjoy! *I like stronger drinks, so I do 2 shots of vodka, but some people don't like the overpowering boozy flavor. Reduce the amount down to 1 shot if you are this person! The flavor is still great.